At The Blaine Health & Wellness Clinic, our chiropractors provide effective treatment options for people of all ages that can address injury, pain, and other discomforts. We offer pediatric chiropractic care, physical therapy, physical therapy for dancers, massage therapy, and auto accident care in addition to our highly successful DMR Method. Though surgery can be a necessary means for treatment, it isn’t always best. The DMR method is a means of pain management and integrative care that eliminates the need for surgery and pain pills. To learn more about the DMR method, read about these clients’ experiences here on our blog or visit our website. One of the most frustrating issues that patients can face is their struggle to get a full night’s sleep. Due to pain levels and the inability to find a comfortable position, many patients who suffer from conditions such as sciatica, chronic neck and back pain, herniated discs, and other conditions, have difficulty getting the rest that they need. DMR can allow you to get more sleep and better quality sleep so you can not only feel rested, but also so your body can heal itself. Headaches should never be a way of life. You should never feel like you have to accept going through life with a pounding headache. Headaches can be a symptom of many types of health conditions and can be alleviated by the DMR treatment depending on the root cause of the headaches. Once their headaches are relieved, our patients often find that they are able to sleep better at night and can avoid pain medication and even surgery. For many patients who have experienced back pain, headaches, a herniated disc, whiplash, degenerative disc disease, and other conditions, implementing the DMR method into their care plan is the final treatment before they have to resort to surgery. In many cases, because of the effective integration of chiropractic adjustments, physical therapy, massage, traction, and joint manipulation, our patients can finally find relief from pain and other symptoms of chronic neck and back issues. Often due to pain levels and muscle weakness, patients with chronic issues have difficulty moving and walking. After using the DMR treatment, many of our patients found that they were finally mobile without pain. Though results often take time, the relief that many patients feel from the DMR Method is undeniable. The DMR Method not only addresses the root of the issue, but simultaneously improves a patient’s quality of life. Living with pain is uncomfortable, exhausting, and affects every area of a person’s life. Pain pills, though sometimes effective, don’t address the root of the problem and can have side effects. Some patients find relief from pain after the first few sessions. 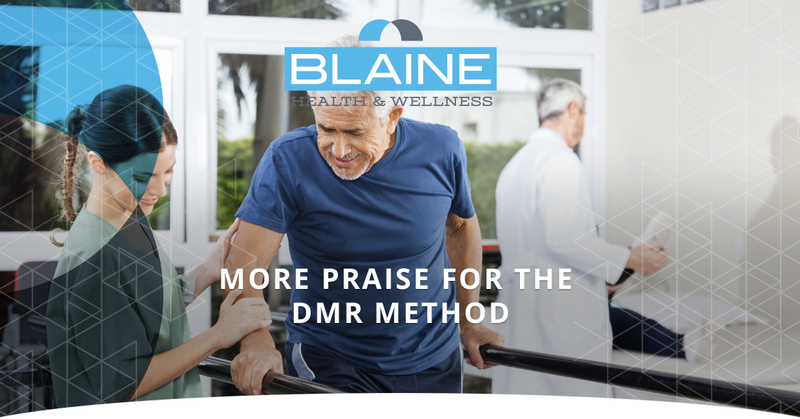 The chiropractors and health care professionals at our Blaine clinic use the DMR Method as a holistic approach to treatment because it has time and time again shown to provide healing and relief to our patients. To learn if the DMR Method is the right treatment for you, make an appointment with one of the chiropractors at Blaine Health & Wellness!